I was a bit uncomfortable with making Jesus out of fondant or molding chocolate, so I ordered one on line. Unfortunately, it did not come in in time! 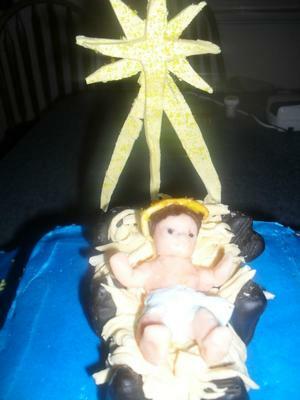 So I had no choice and I molded the manger out of fondant. Ideally a week before the cake is due is when I like to mold all my figures. However I did not have that luxury this time. I molded it using my fondant tools to make lines in the sides of the manger for a wood effect. I also, made a hole in the bottom of the manger where Jesus' head was to lay, for a small battery light. Carefully brush the star with water, so it is slightly moist. Then sprinkle a little yellow or golden edible glitter. Next, using molding white chocolate I took on the task I feared the most and I began to mold Jesus. Molding chocolate is absolutely wonderful to work with. You will love it!! It is holds up better than fondant and doesn’t dry out or crack the way gum paste sometimes does. It holds shape beautifully. I tinted the chocolate a flesh color and molded Jesus. I used my own manger as a guide. Using my fondant tools I made the impressions for the details in Jesus' face. I tinted a little chocolate brown for his hair and a little blue for his wrap. The halo is a little fondant that is rolled like a thin rope. Dampen it before you set it on Jesus' head a put a little of that yellow or gold glitter on it. I let these set overnight. For the hay, I tinted fondant and rolled out thin. I cut the fondant into 3 x 1 inch rectangles then on one of the long ends I cut into the fondant 1/4" apart or less did this till the manger was covered with it. Make sure to leave the hole for the light open. Don’t let the fondant lie flat; make sure some of it is almost messy looking, so it can look like hay. After all, hay is not neat. Insert the battery light in the manger and then carefully place Jesus in the manger. The cake I made was yellow and for the bottom is 14” square. The top is 8” square. Always level your cakes. Even if they look even, I assure they are not and you will regret it if you don’t. I filled the cake with a light chocolate whipped mousse. Delicious!! Once both tiers were leveled and filled I covered them in buttercream tinted blue. I wasn’t very happy with the color so I decided to make it more of a midnight blue using my air brush. This cake would have been lovely in fondant also, but I was asked to make it using buttercream. I always protect my cake bases form buttercream with waxed paper. Otherwise you could soil the cake base or have a grease ring around the cake, which really is not appealing. After the tiers were supported with dowels and stacked using a #9 tip I piped a bead border for a more finished look. I airbrushed it and sprinkled a little clear edible glitter over the cake. I was much happier with the color then. So I carefully began removing the waxed paper protection but most of it pulled away from the bottom. Because I airbrushed the cake, I could not pipe another border. The color would not have matched, so I used 1/2" silver glitter ribbon that I had. I was pleased! It gave it a nice look. I placed the manager on top with baby Jesus in it, of course. I then very carefully placed the star right behind the manager. Using a #3 tip I piped little crosses to look like stars. I first piped the stars to read “HAPPY BIRTHDAY JESUS”. It was tedious and time consuming but gave a different look than just writing it on the cake. After all the stars are piped with the birthday message, begin piping stars throughout the cake. Don't forget to show how to turn the light on in the manger. It really gives the cake a nice look. 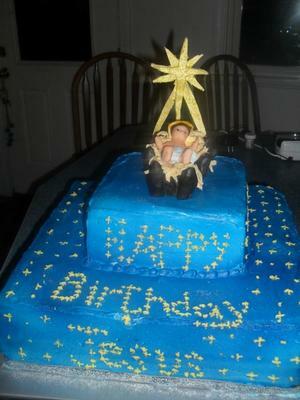 Baby Jesus is definitely the star of this cake. Everyone loved it and I'm sure will love yours as well!! Have fun!! Comments for The Reason for the Season. Absolutely beautiful!!! U make it sound so simple I am almost tempted to try it myself!!! (notice I said ALMOST lol)!! !